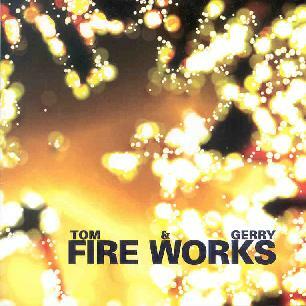 Tom & Gerry - "Fireworks"
I always get excited when I hear free-improv music that has elements of appeal to our space rock readers. Something to bridge the gap between the abstract and music I can offer to my space brethren as a way to introduce them, with sounds they can identify with, to the world of free-improv. Tom & Gerry are Thomas Lehn on analogue synthesizer and Gerry Hemingway on drums, percussion, and voice, and Fireworks is made up of recordings from various points on their 2000 tour. The synthesizer is, of course, capable of producing nearly countless sounds. But what makes Lehn and Hemingway such an interesting pair is that Hemingway is able to match Lehn in the range of sounds and textures he produces on percussion. Given the obvious jazz influences, the closest analogy is Sun Ra, the great master of freaky electronics within a jazz context. Hearing killer keyboard runs played on a synth with the freaky meter kicked up to full throttle and blazing along with percussion is electro-acoustic heaven. As a longtime fan of experimental electronics it's a joy to hear a jazz keyboardist playing cosmic bleeping swirly synths. But there are quieter ambient moments as well. For example, the near silence in the opening minutes of "Fishes And Whistles" is just as passionate as the fire heard anywhere else on the album. But this track also includes some of the most fiery and passionate moments on the album. When Lehn goes into full cosmic chaos mode the music occupies a unique space that spans both jazz and experimental space electronics. In summary, Tom and Gerry are an intriguing duo with crossover appeal to a variety of music fans. And the venues these performances were recorded at were excellent choices as the sound quality is excellent. Highly recommended.